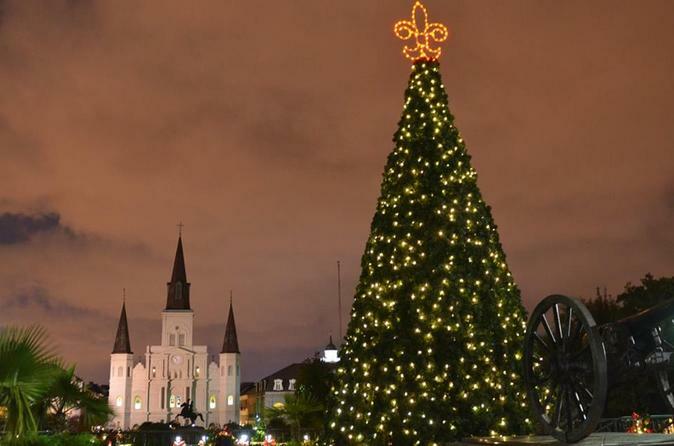 Christmas is a special time in New Orleans, it’s an experience that you and your family will not want to miss. During the holiday season, the city is aglow with twinkling lights and decorated iron-laced balconies. It is a very special time of year for New Orleanians and tourists alike. During this tour guests will stroll thru the French Quarter and experience Christmas Nola Style. Guests will visit many historic homes, museums, churches, even bars that are all decorated for the holiday season. Hear stories of each locations history and it's importance to New Orleans. Guests will be allowed to stop and grab drinks at bars along the tour route. Christmas New Orleans Style started three decades ago to highlight the way residents spend the holidays in the Big Easy. This event has expanded over the years and it is a month-and-a-half-long celebration that has helped promote New Orleans as top holiday destination. Stroll through the world famous French Quarter with an adult beverage in hand if you would like to do so! Guests will be in awe of the extravagantly decorated historic homes and buildings throughout the French Quarter while hearing the importance of the historic homes and beautiful buildings during the course of the tour. This tour is a great way to learn about New Orleans history while experiencing the magic of Christmas in New Orleans. You will visit many historic locations during the tour. See St Louis Cathedral, the oldest operating church in the United States, Jackson Square, museums, the LaLaurie Mansion and much more. This tour contains history, ghost and vampire stories along with information on the famous New Orleans voodoo. The tour group will have paranormal equipment offered for anyone interested in the ghost stories. Also, hear stories about the people who helped shape New Orleans into the city that it is today. Visit the homes of movie stars right in the French Quarter and see where filming has taken place and currently takes place today! Come take part of a holiday tradition has been going strong for decades -- enjoyed by all! Keep in mind that the tour group will stop at bars along the tour route to provide the guests with restroom breaks and the opportunity to purchase adult beverages and soft drinks if they would like. These stops are offered as a courtesy. If you have a child with you, some bars allow children inside however some do not. The tour guide will be more than happy to stand at the door with the child to allow the adult the chance to grab a drink. We do everything we possibly can to provide a laid back environment for our guests. We want all our guests to be happy & enjoy themselves during our tours. Our goal is to provide a happy memorable experience for everyone.